ES-Biax 18 Integrated Biaxial Shaker - PVL Technologies, Inc. 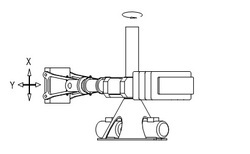 Directions of shaking for ES-18 Biax Shaker when mounted on centrifuge. frequency response. 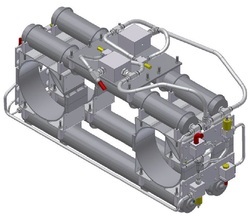 Each actuator incorporates two integrated hydrostatic spherical pad bearings to provide extremely rigid axial coupling to the slip-table while also providing a nearly frictionless transverse and rotational interface. - integrated mounts for optional attachment of accessories such as PVL's CRM-4 in-flight robotic manipulator, loading devices such as PVL's LF-2 hydraulic load frame, camera systems, etc. - includes an instrumentation shelf for placement of data acquisition and control hardware. 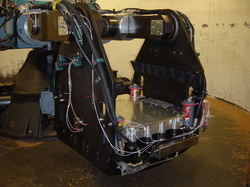 The shaker platform is designed to be interchangeable with the original centrifuge platform and can be easily installed or removed from the centrifuge by making or breaking the hydraulic and electrical connections and subsequently following the centrifuge manufacturer’s procedure for installation and removal of the platform.